Written on November 24, 2014 . Posted in Announcements + Updates, Architecture and Design. 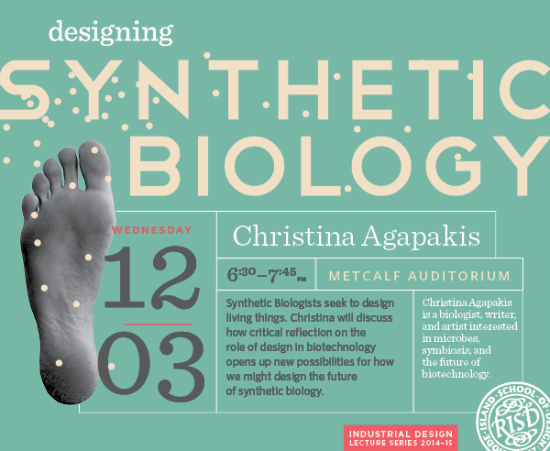 Christina Agapakis will discuss how collaboration between biologists engineers, designers and artists has created opportunities to explore the potential applications and implications of these technologies as well as the complex contexts, cultural and biological, that shape biodesign. Christina has a PhD in bioengineering from Harvard, she is a writer for the Scientific American blog network and other online venues, including Discover Magazine, Popular Science, Omni Magazine, The Toast and is a adjunct professor of Media Design Practices at Art Center College of Design.